I broke up with my therapist recently. That sounds a bit dramatic. What I mean is that I ended a formal relationship with a talk therapist I’d been seeing fairly regularly over the past few years. And, like all break-ups, even the ones that you know need to happen, I felt incredibly sad afterwards. Therapy’s not for everyone. I used to be really surprised when people I was close to would admit that they’d never been to a therapist. Or that they had come to the conclusion, without ever having tried it, that “therapy was just not for them.” Really? I would wonder to myself. How do you make sense of this giant, unscripted blob of feeling and experience we call life? My basic view on therapy is that it’s a bit like a well. There are times in your life when you’ll need to crank that bucket of water up fairly regularly for a drink. And there are other times when just a sip can last you a long time. So why did I leave? Part of it was money. I’m just starting a new business, so I couldn’t really afford to have so much money flowing out of my checking account without a lot more coming in. But mostly, it was that I felt like I’d made a lot of progress on a whole host of fronts – personal and professional – over the past year. So I could trust in myself to use some of the insights I’d gleaned from her – along with some of the tools listed above – to manage on my own for now. Which doesn’t mean I’ve arrived anywhere. I used to imagine that there was this magical place in adulthood where the sun came out and you could skip through the puddles and no more clouds would appear on the horizon. Ever. Spoiler alert: it’s not so. And more to the point, therapy is not about arrival. It’s about accepting that the journey really is forever. Which doesn’t mean there isn’t some sadness that comes with the bargain. I hate good-byes. For goodness sake, I well up when I hear “Puff the Magic Dragon” because it conjures up such raw feelings of loss. So a big part of me just wanted to send my therapist a text and call it quits so as to avoid the drama and pain of separation. She was having none of it. Like any good therapist, she knew that you can’t run away from those feelings. You need to acknowledge the sadness of letting someone close to you go and wish each other well. I had coffee with a friend recently. We have a lot in common, and tend to coach each other on everything from career change to creative writing. But in this particular conversation, I discovered that there was one issue where we were profoundly out of sync: she’d never seen a psychotherapist. Ever. I, on the other hand, can’t imagine going through life – and especially middle age – without having talked things over with a professional. Daphne Merkin’s recent essay in The New York Times Magazine about her lifelong search for the perfect psycho-therapist has generated quite a bit of buzz. As I noted last week, when I first read Merkin’s piece, I was fairly sure that it would serve as another great example of the age-old aphorism “there are two types of people in the world…”. On the one hand, I knew that some people would be turned off by this five-page, detailed meditation on Merkin’s ongoing relationship to psychotherapy, using it as confirmation that psychotherapy really is just an extended exercise in (pointless) narcissism. On the other hand, I also imagined that there would be people (like me) who — while acknowledging the self-indulgent nature of therapy — find both the process and analysis…of analysis…endlessly fascinating. Which is another way of saying that I couldn’t put the article down. Those predictions turned out to be right, as a quick scan of the Letters To The Editor on that post in The New York Times will attest. But while I’m generally in the supportive camp on therapy-as-life-strategy, I think it’s worth looking at the critiques that are emerging from the article about psychotherapy more generally. They seem to come in three varieties. 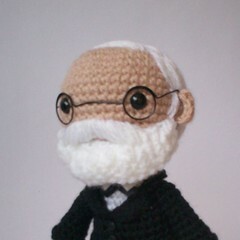 Image: dr_sigmund2 by zoria via flickr under a Creative Commons license. This week’s list is inspired by the front page article in the New York Times magazine over the weekend by Daphne Merkin, which provides an account of the author’s life-long search for the perfect psycho-therapist. I have a feeling that this article could serve as another great example of the age-old “there are two types of people in the world…”. On the one hand, there are undoubtedly people who will be turned off by this five-page, detailed meditation on Merkin’s ongoing relationship to psychotherapy, using it as confirmation that psychotherapy really is just an extended exercise in (pointless) narcissism. On the other hand, there are people (like me) who – while acknowledging the self-indulgent nature of therapy – find both the process and analysis…of analysis…endlessly fascinating. Which is another way of saying that I couldn’t put the article down. Wherever you fall on the “therapy as literature” debate, I do think that seeing a therapist of any sort can be extraordinarily useful at certain points in your life. And, apparently, more and more of my adopted country’s citizens agree with me. While talk therapy has long been an important part of American life, more and more Brits have gotten on board with psycho-therapy in recent years. A a recent survey suggests that 94% of people in the U.K. now consider it acceptable to have counseling and psychotherapy for anxiety and depression, compared with just 67% in 2004. 1. It gives you a narrative. Whether of not you actually pay someone to help you do this, most of us spend a good portion of our adult lives trying to figure ourselves out. Therapy is a useful tool in that process because – if you stick with it long enough – you gradually acquire a story that you can tell yourself to make sense of your past. At the risk of dumbing things down, think of this as a sort of “thesis sentence” (remember 9th grade English?) about your life. It might be something as simple as “I was put on this earth to accompany my sister” or “I was invisible to my parents.” Whatever it is, having a framework about yourself is helpful for moving forward. 2. You identify patterns. As you begin to unearth your own narrative, you’ll discover that you have a habit of repeating certain behaviors. In my own case, a shrink once casually observed that “freedom of movement” is a defining characteristic of who I am. And in one fell swoop, I made sense of about five different things going on in my life, from relationship issues to living overseas. It’s not until you can clearly see the patterns that you can think about change. 3.You normalize your problems. “Ordinary Misery” or “Ordinary Unhappiness” (to generously paraphrase Freud) is the goal here, folks. Which is another way of saying that if you stay inside your own head too long you run the risk of thinking that your problems are worse than they are. Conversely, by talking to someone else about your problems you come to see that a.) you aren’t insane b.) lots of other people share your issues and c.) all of these things are fixable. This does not mean that you’ll necessarily end up “happy” (whatever that is). But in converting your demons into ordinary problems, you’ll be happi-er, which is probably enough for most of us mere mortals. 4. You change your life. Or at least you have the tools to do so. In my own case, I can point to several major life changes that wouldn’t have happened without therapy, ranging from the profound (career change) to the seemingly-trivial-but-in-fact-hugely-consequential (yoga). Provided that you do it the right way, therapy offers you a chance to take abstract insights about yourself and apply those towards concrete changes in your life. 5. It offers hope. See 1, 2, 3 and 4. And in an era where suicide rates are up among middle-aged Americans, that’s nothing to sneeze at. I’m over on Politics Daily today talking about the new trend towards early puberty in girls and what it might mean for everyone else. 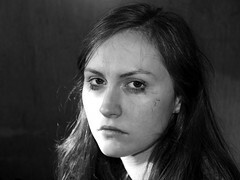 Image: Week Five – Face of Depression by Jessica Hime via Flickr under a Creative Commons license. Yesterday was New Year’s Eve, which is – as we sit back and contemplate our various “top 10” lists from the past year – often an occasion for nostalgia. I was also feeling nostalgic yesterday, though my nostalgia wasn’t for what changed in 2009 so much as for what’s changed over the last century. I’m just back from a vacation in Vienna, you see. And unlike other European capitals I’ve visited in recent years — Paris, Amsterdam, Helsinki — Vienna feels decidedly less modern and cosmopolitan. Instead, it’s got that proverbial “Old European” feel, the kind that makes you reach for one more hot chocolate mit schlag, crank up the Johann Strauss and break out the Wittgenstein. 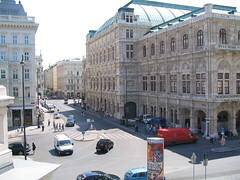 Image: Vienna State Opera by tm boris via Flickr under a Creative Commons License. Yesterday I published a short essay in The Guardian Weekly about how hard it was to find a therapist in London. I write a lot of essays, but this was one of my favorites because: (a). it’s 100% true and (b). because of (a), I happen to find it funny. The basic thrust of this essay is that as an American, I thought having a therapist was the norm for any warm-blooded, reasonably introspective middle class person living ANYWHERE. Turns out, it ain’t so. At least not in ye olde, stiff-upper-lipped England. When I told my GP (internist) in London that I wanted a referral for a therapist, she looked at me as if I were mad. Therapy? Here? in Great Britain? You’ve got to be nuts! (No, really, she thought I was nuts…) You can read the rest of the essay yourself…here. One friend confessed that she’d just sacked not one, but two, of her own therapists in rapid succession, but had signed her husband up for therapy. Another friend (European) suggested that I extend this analysis to examine the relative receptivity to mental health provision across Europe, comparing France, Italy, the UK, even Finland. And in a curious case of life…imitating art…imitating life, I got an email from my own (current) therapist, who confessed that she, at times, was guilty of kicking her washing machine rather than trying to figure herself out properly. Which is a long way of saying that I think people responded to this piece because it resonates. And the reason it resonates is that adulthood is, at the end of the day, one giant, protracted effort to figure yourself out. Now don’t get me wrong. Loads of people do this without benefit of a therapist (I don’t happen to know them, but that’s another story). But doing therapy – whether it’s traditional psycho-analysis, talk therapy, or some form of groovy self help’y sorta thing – (I’ve done all three) – is a HUGE part of “finding yourself in adulthood” (to coin a phrase). I’ll have loads more to say in this blog on the topic of therapy – one of my not so closeted obsessions. But for now I will sign off with this, one of my all time favorite cartoons. I think it pretty much says it all, no?